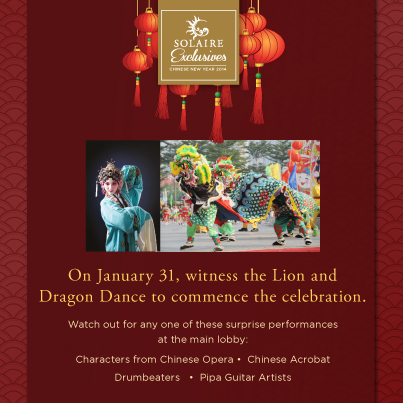 Join Solaire Resort and Casino as they usher in The Year of the Horse with colorful traditions and feasts this January. On Friday, January 31, 2014 which marks the Chinese New Year, guests will be treated to the centuries old tradition of Lion Dance. This practice is believed to remove negative vibrations as the lion dance is always accompanied by a cacophony of drums and cymbals and an exhibition of firecrackers. Performance will begin from the lobby and will move to the different areas of the resort. The favorite Chinese New Year staple- "Tikoy" is also available at Solaire and they made it more special by turning it into a "Koi fish-shaped" Tikoy which comes in elgant boxes that guests can give to their family and friends. It is believed that giving sweet and sticky "Tikoy" strengthens the bond of relationship between people. This treat is available for take-out at Red Lantern located at the ground level till February 14, 2014. For bulk orders, guests should call 888-8888.